Love it or hate it, Times Square keeps shining brighter, year after year. 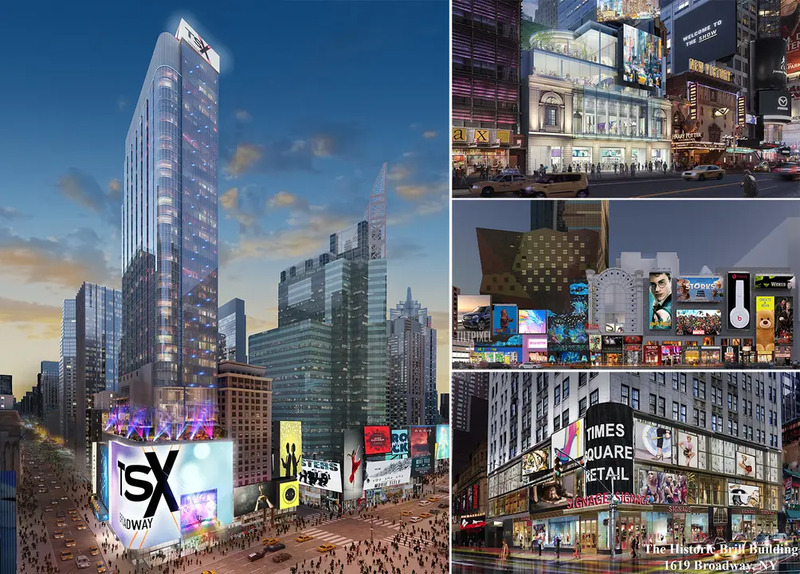 On the heels of the announcement that Stillman Development will restore the Times Square Theater into a retail galleria, a consortium of developers (L&L Holding Company, Maefield Development and Fortress Investment Group) unveiled plans for TSX Broadway, a $2.5B redevelopment of the historic Palace Theatre and an existing Embassy Suites hotel at 1568 Broadway. According to a press release from Friday, “TSX Broadway will provide a single brand with the most powerful marketing tool in the world, creating a dominant brand presence in the heart of the world’s most visited pedestrian destination.” The rather complex project, designed by Platt Byard Dovell White Architects (PBDW) and Mancini Duffy, entails 550,000 square feet of retail/entertainment space in addition to a 669-key hotel above. Not to worry, the existing landmarked theater isn’t going anywhere, except up that is. The 105-year-old space will be lifted 30-feet higher and sit on the new development’s third floor. While the theater lost its beautiful classical facade decades ago, its Beaux-Arts-style interiors remain intact and will be completely restored in a $50 million endeavor to begin this winter. The raising of the 1,600 seat theater will free-up coveted Bow-Tie-district retail below, which according to Cushman & Wakefield has an ask of $1,993 per square foot. Once the theater is lifted, an entirely new structure will be built around it, meaning the 46-floor Embassy Suites Hotel, designed by Fox and Fowle, will be the second tallest hotel building ever demolished. Simultaneously, a few avenues over, JP Morgan plans to demolish its current 716-foot-tall headquarter building, making it the tallest and largest building ever intentionally dismantled. 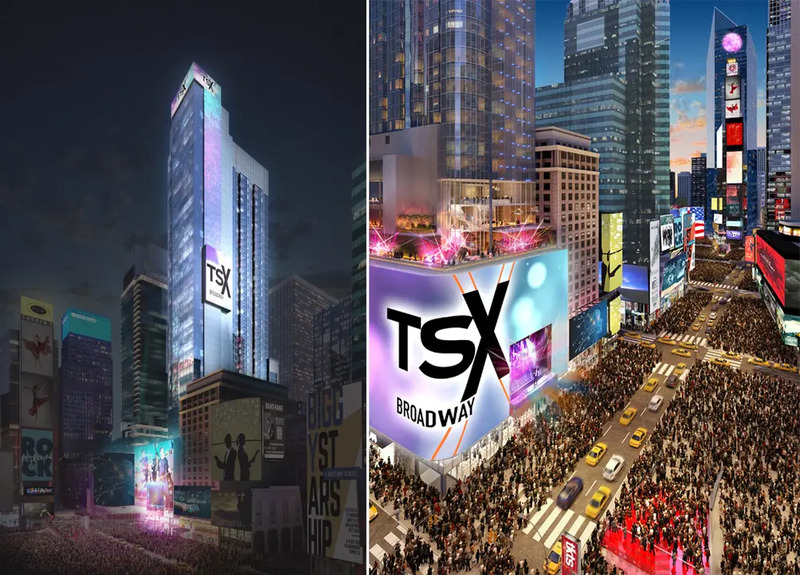 Tantalizing details about TSX Broadway include the only permanent outdoor stage in Times Square and the most technologically advanced signage and lighting package in New York City. There will be an 18,000-square-foot LED sign wrapping the podium, and a full-building façade lighting system that will activate the entire 46-story tower as a branded beacon. The base will be filled with 75,000 square feet of flexible retail space and 30,000 square feet of dining experiences, topped by a 10,000-square-foot outdoor terrace. Each room in the planned hotel above will have floor-to-ceiling windows and direct views of the square. Other recent Times Square projects include the opening (and soon closing) NFL Experience Times Square, the repositioning of the Brill Building by Brookfield Properties, the rather uninspired overhaul of the Bow-Tie Building, and whatever is going to replace the old Hershey’s Chocolate World at 1601 Broadway.